Because of the great weather of the past few days, I just longed for a refreshing snack. 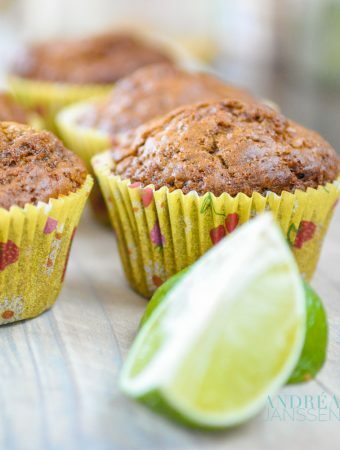 These lime muffins are perfect. 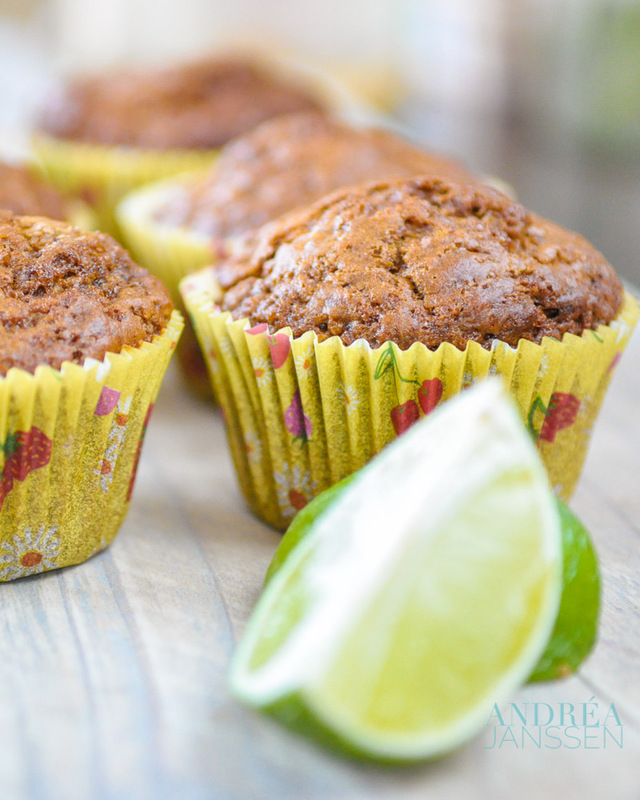 The slightly sour taste of the lime is a delicious combination with the sweetness of the muffin. And the portion size is great to eat as a snack. 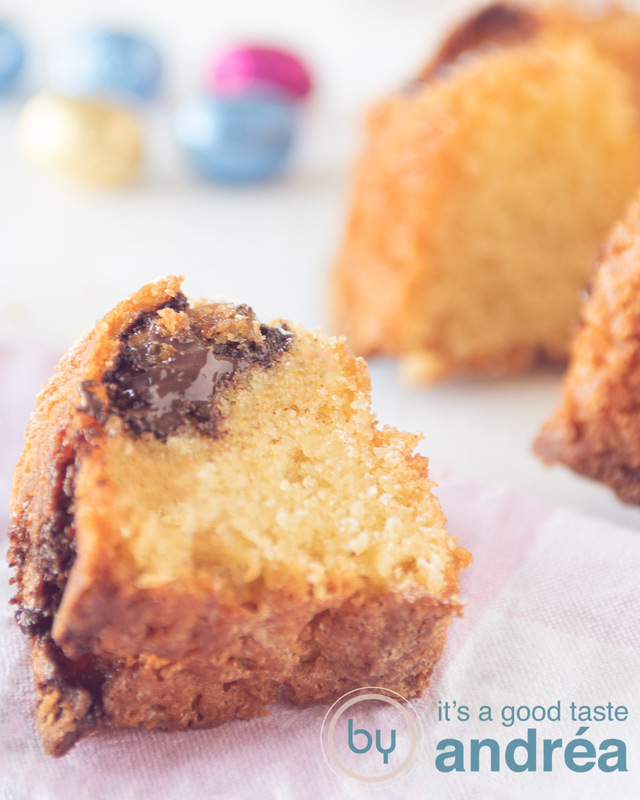 Certainly I’m going to make this muffins many times! Today, I’ve got a cooking workshop, so no work in the picking garden. It’s a shame with this beautiful weather, but first work then …. There are many fruit trees that bloom on the homestead, but by far the most beautiful is the cherry tree among the tulips. Don’t you agree that’s the most beautiful? Put the paper forms in the cupcake tins. Grate the zest of the lime then press all the juice out of the lime. In the first bowl put the flour, baking powder, lemon zest, salt and sugar. Mix in a second bowl the yogurt, eggs, honey, milk and lime juice. Pour into the first bowl and mix with a spatula until well blended. It does not matter if there are some small lumps left. Divide the batter between the muffin forms and put them for 20 to 25 minutes in the oven. Remove the muffins from the pan and let them cool on a wire rack. 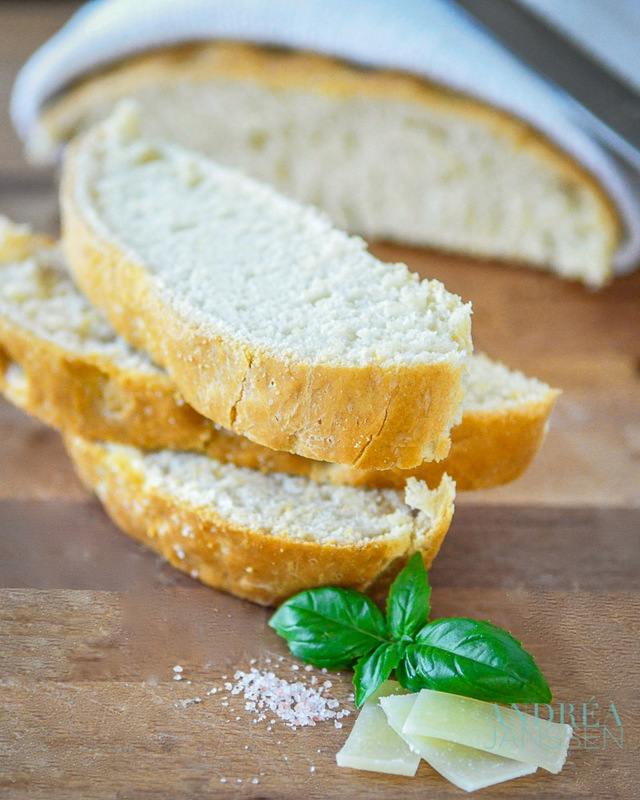 A delicious crunchy bread without sugar. It’s easy to make (you do not even have to knead and rise the dough). 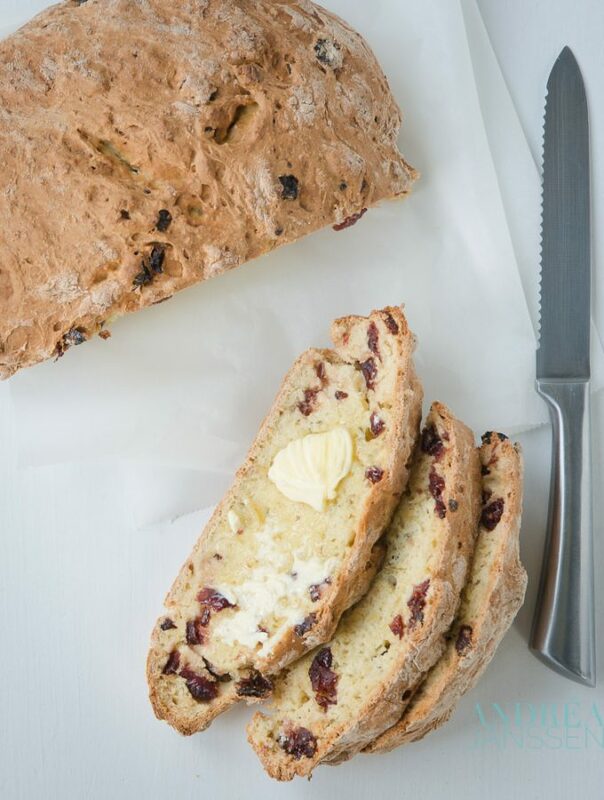 A delicious soda bread with cranberries and rosemary. Very easy to make, because you don’t have to knead it. And in this case you won’t use yeast, but baking soda to let the bread rise. What you get is a very tasty, but also airy bread. That really excels when it is still warm and it only needs a little butter and nothing else. 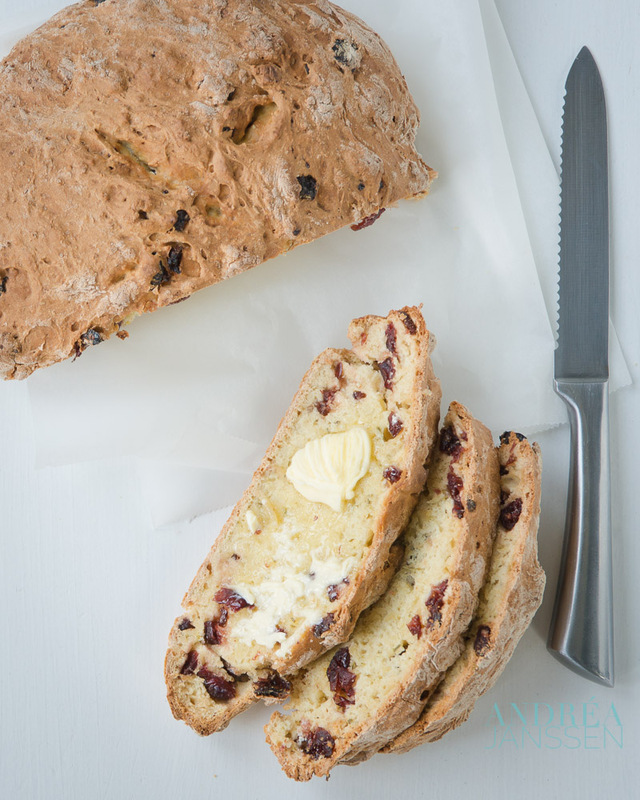 The cranberries give a lot of sweetness to the bread and the rosemary has a nice aftertaste. baking soda can be bought cheaply at the Toko (Chinese supermarket) under the name baking soda. It is also sold under the name sodium bicarbonate and is now available at the supermarket. to make baking soda “work” you need an acid. In this recipe that is buttermilk, but yogurt is also used often. If you don’t have either of this at home, you can use a teaspoon of vinegar per 250 ml of milk instead. That also works very well. Soda bread has one small disadvantage, you can’t store it. So you’ll have to prepare it and immediately eat. You can possibly heat it a little in the oven, but this is really the best when it is just baked. if you want a sugar-free bread, then don’t use the sugar. This recipe goes great without it. Sift the flour, baking soda, sugar and salt into a bowl. Stir in the cranberries and rosemary and make a hole in the center. Knead the dough lightly and flour the surface. Form the dough in a round bread of about 15 cm diameter. Put the breadon the baking sheet and with a sharp knife make a cross in the dough. Put the bread in the oven and bake for 15 minutes, then reduce the temperature to 200 degrees Celsius and bake for another 20-25 minutes until the bread is golden brown. 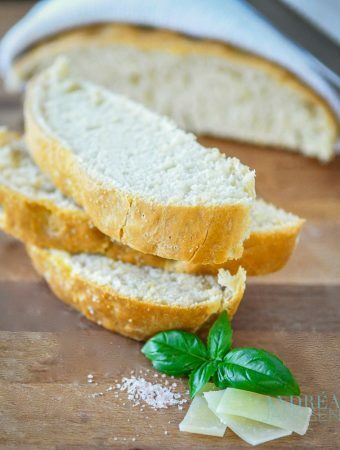 Check whether the bread is sufficiently cooked by tapping on the bottom, it should sound hollow, otherwise you extend the baking time by 2-3 minutes. Focaccia, a typical Italian bread, in the early days baked on hot stones and that became wonderfully airy. Focaccia is delicious with a soup or barbecue. Without additions it’s lovely, but you can also add flavors or filling . Now I had some leftover basil and parmesan cheese salt (yes this salt is so delicious that it has vanished fast!) . I’ve bought it in a small local shop called Kookstijl and used it before at the recipe spaghetti with shrimps and arugula. (If you can’t buy it in your neighborhood, try mixing some sea salt with grated parmesan and chopped basil.) But this salt is so great that I had to use it to pimp this focaccia. And after baking the bread had a nice savory flavor. It is one of those bread that’s already so delicious that it needs nothing more. Ideal to accompany a soup or as a snack and appetizer. Put all ingredients in the bread machine in the right order as specified by the manufacturer. Then turn the machine on the dough mode into the position in which the machine kneads the dough and run the 1st rise. Go further at the *. Put the flour in a bowl with the salt and mix well. Then mix the oil through it. Stir well with a wooden spoon so that all the liquid is absorbed. Stir in the yeast mixture and start kneading (by hand or with the mixer). Knead until the dough is smooth and elastic to the touch and that will certainly takes 10 minutes of kneading. Shape the dough into a ball . Turn once and cover the bowl with a damp towel and put it away on a warm place. Let the dough rise for half an hour (or until doubled in volume). Lay the dough on a greased workplace. Press the air out, form a ball and let it rest for 15 minutes. Press the dough into an oval. Place the damp towel over the dough and leave the bread to rise for an hour in a warm place. After half an hour preheat the oven to 200 degrees Celsius. After the second rise you moisten the top of the loaf with water. Push with your fingertips dimples in the bread. Mix the basil, with the Parmesan cheese and sea salt and sprinkle the top of the focaccia. Put this bread in the oven for 20 minutes and then remove the bread from the oven. 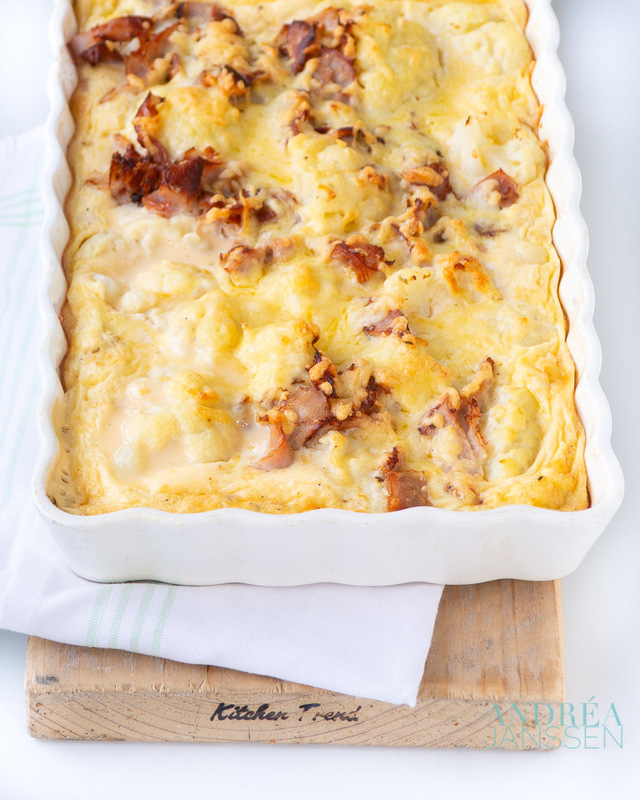 A Serbian savory cake recipe: Katmer pie with spinach and ricotta filling. A delicious vegetarian meal you won’t stop eating. Even though the Daring Kitchen has ceased to exist, I continue to make all the recipes that have been there. Such a delicious recipes I definitely want to try. This recipe for Katmer Pie was given to us for the Daring challenge of February 2016 and written bij Mikilca from Mimi’s Kingdom food. A for me unknown sort of savory quiche that reminds me of a Spanakopita, a Greek savory pie with spinach, but with a different kind of dough. So I was very curious about this recipe. With the Greek spanakopita recipe, the dough is crispy, but does not add much flavor. It seems to be more packing of the stuffing. The dough for the Katmer Pie is creamy and tasty. A nice combination with the filling whereas you will have to keep eating. I knew spinach and ricotta were a great combination, but this dough is a really good addition. Make sure you melt the butter and let is tand for 5 minutes. The solid particles will sink to the bottom and if you pour the butter very carefully into a bowl (leaving the solid particles in the pan), you will get Ghee which you need for this recipe. Taste the spinach ricotta mixture and add salt and pepper. Spinach and ricotta are flat flavors that may use a lot of spice. Bake the Katmer pie in an oven with top and bottom heat, then it won’t dry out, but remains beautifully creamy. You just couldn’t eat the whole quiche. Don’t worry, you can freeze it afterwards. The Katmer pie gots a 2 months shelf life in the freezer. Just heat in the oven and have a nice second meal. 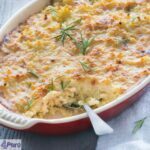 A Serbian savory cake recipe: Katmer pie with spinach and ricotta filling. A delicious vegetarian meal you won't stop eating. Put the flour, water and salt in a bowl and mix until you have a soft dough. Dust your work surface with some flour and knead the dough even further until it is beautifully elastic. When the dough sticks, add some extra flour. Divide the dough into 6 equal pieces and allow them to rest for 10 minutes under a towel. Grab a piece of dough and roll it out into a round shape until it is about 3 to 4 mm thick. Repeat that for all pieces. Take a round of dough and brush it with the ghee. Put a second round of dough on top. Brush the second round of dough with ghee and place a third round on top. Place this pile of 3 slices of dough aside and repeat for the remaining 3 rounds of dough. Let the two stacks of dough rest for 10 minutes under a towel. 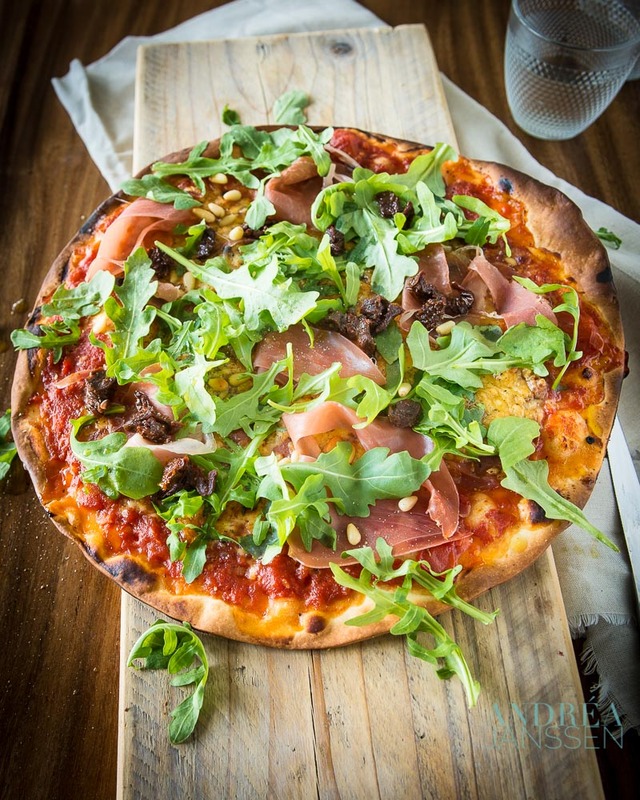 Grab a pile of dough and roll it out to a thickness of 6-7 mm in a round shape. Put a glass in the middle and cut with a sharp knife from the outside 8 times to the edge of the glass (divide them over the round dough). Continue until you have folded all the pieces in. Allow the dough to rest under a tea towel and continue to make the filling. Wash the spinach and cut into thin strips. Put it in a large bowl and add the eggs, salt and cheese. Mix everything well together. The best way for me is to knead the filling with my hands. Brush a baking tin with the ghee. Grab a pile of dough and roll it out until you have the size of your baking tin and cover the tin with the dough. Spread the filling over the dough, keep about 2 cm from the side. Grab the second pile of dough, roll it out to the size of your baking shape and put it over the filling. Push the dough onto the other dough to stick it. 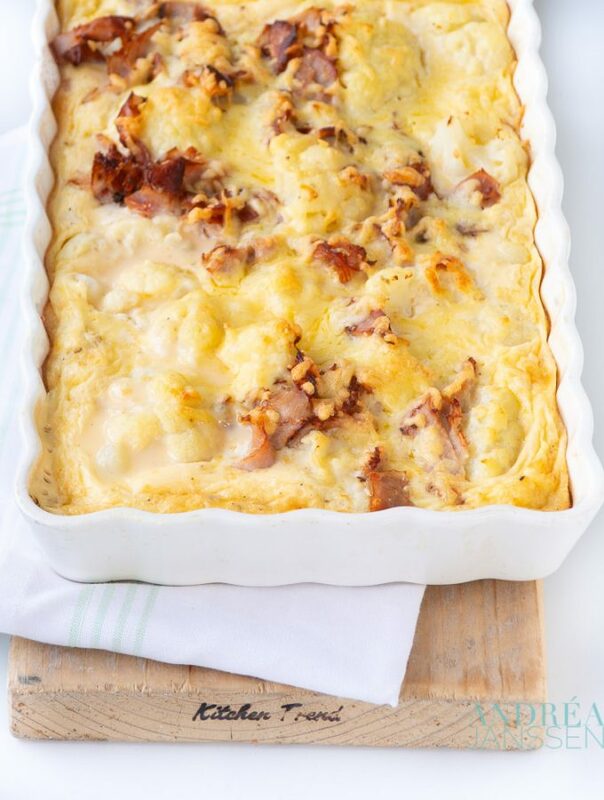 Bake in the oven for 30 minutes and serve. Preheat the oven to 180 degrees (convection oven) or 200 degrees Celsius (top and bottom heat). Butter the cups of a muffin tin and line with paper cupcake tins. Grab a bowl and sift the dry ingredients (flour, cocoa, baking powder and salt) into the bowl. In a second bowl you put the butter and sugar and whisk for about 3 minutes, until the butter mixture is fluffy and pale yellow. Add while you keep mixing on high speed, the eggs one by one and the vanilla extract. Turn the mixer to low speed and add 1/3 of the flour mixture, 1/2 of the sour cream, 1/3 of the flour mixture, remainder sour cream, and the rest of the flour. Stop immediately when all is mixed well. Divide the batter over the cupcake tins. Put the baking pan in the oven and bake the cupcakes in 25 minutes. Remove from the baking tin and let cool on a wire rack. Heat the cream until it is hot and just not to the boil (you can see already vapor arise). Pour the cream into the bowl with chocolate and stir until the ganache is smooth. Brush the top of the cupcake with the ganache. Put in a clean bowl the egg whites, salt and sugar. Bring a pan of water to the boil and hang the dish with egg whites above. Start beating. Beat until the sugar completely dissolves. Remove the bowl immediately from the heat and take the mixer. Mix 10 minutes on high speed until glossy peaks occur. The mixture is still lukewarm. Mix the butter in and beat until smooth. Bring a second saucepan of water to a boil and hang a bowl containing the white chocolate above. Melt the chocolate, remove the bowl from the heat and let it stand for 5 minutes to cool slightly. Spoon the melted chocolate to the egg white mixture (called Italian meringue) and mix until well blended. Put the white chocolate cream into a piping bag and pipe a nice tuft on top of the ganache. This rose apple pie is delicious te eat and beautiful to see. Although it takes some time to prepare, you won’t regret it for sure. I made this cake for Valentines day, it’s just perfect. But for any moment you will make a great impression you can certainly serve this great cake. It’s really delicious for it’s creamy butter cream layer, the sweet sand dough and crispy apple (they’re not cooked so they’ll stay fresh and crispy). When you’re baking the cake blind, make sure the dough sticks out a bit above the form. The dough can shrink a bit when baking and this way it looks nice. Use butter from cows feed with grass for the butter cream. You don’t want to have any lumps in your butter cream. Cows fed with hay wil give harder butter and therefor a bigger chance for lumps. After slicing lay the apples in a bowl of water with lemon juice. That way the apples won’t color when placed on the cake. Before adding them you’ve to make sure the slices are dry. Otherwise the butter cream wil thin and drip of your tart. Afterwards smear the apple pie with apricot jelly combined with gelatin. Another trick the apples won’t color and the tart will shine beautiful. This rose apple pie is delicious te eat and beautiful to see. Although it takes some time to prepare, you won't regret it for sure. Valentine’s Day, you love it or you hate it. Something in between doesn’t seem to exist. I think it’s a great idea for a day to do something special for your love, but you really do that every day anyway? I hate the commerce around it, by buying a gift for your love. Just to easy. No. I like to do something special. A nice DIY, a delicious meal or bake something sweet. Like this Valentine ice hearts. Delicious ice cream surrounded by two chocolate biscuits. You can vary it to your own taste. I used strawberry ice cream (just because it’s so beautiful pink), vanilla ice cream (delicious with chocolate) and chocolate ice cream (if you’re a true chocoholic I can’t say no to that). Of course I used a heart shape for the cookies and the same cookie cutter for the ice cream. So it suited all nicely together. The cookie dough should be very cold. That way, the hearts won’t run out and they hold their shape (if you want more cookies bake tips, you’ll find them here. (Following these tips for baking cookies they simply can’t fail anymore). Roll the cookies out between two sheets of baking paper and remove the top sheet before you cut the hearts. If the dough should stick, put it briefly in the freezer. Allow the cookies to cool to room temperature after baking (otherwise the ice melts right away). Press the shape with a cookie cutter into the ice, take out and put it between two cookies. 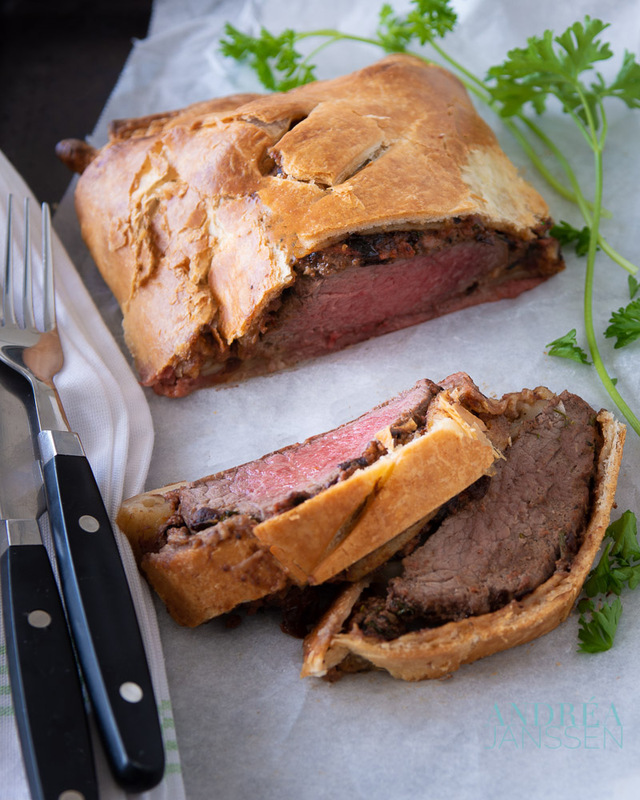 Then pack it in baking paper (so you do not get any ice crystals on the outside). Place the package for at least 20 minutes in the freezer so that it becomes hard. This way you can save them for a week. In a bowl mix the dry ingredients: flour, cocoa and salt. In a second bowl you put the butter and powdered sugar. Mix about 3 minutes until the butter mixture is airy and light yellow in color. Add the egg and vanilla extract and mix further. Turn the mixer to low and add the dry ingredients. Mix until everything is just combined. Form a flat disk of dough and pack it in plastic foil. Put that at least 1 hour in the refrigerator. Roll out the dough between two baking papers until it's about 0.5 cm thick. Remove the top sheet of parchment paper. If the dough sticks too much, put it in the freezer for 10 minutes, afterwards it is easier. Cut with a heart-shaped cookie cutter hearts out of the dough. Put the cookies on a baking plate with baking paper. Put the baking sheet in the refrigerator and preheat the oven to 180 degrees Celsius. After 30 minutes bake the cookies for 7 minutes, then turn the baking sheet and bake for another 7 minutes. Remove the cookies from the baking paper and let them cool on a rack. Put the heart cookie cutter on a flat surface and fill with ice. Remove the ice from the cutter. Place a cookie bottom in front of you, top with heart-shaped ice cream and place another cookie on top. Cover with parchment paper and place in the freezer (at least 20 minutes). 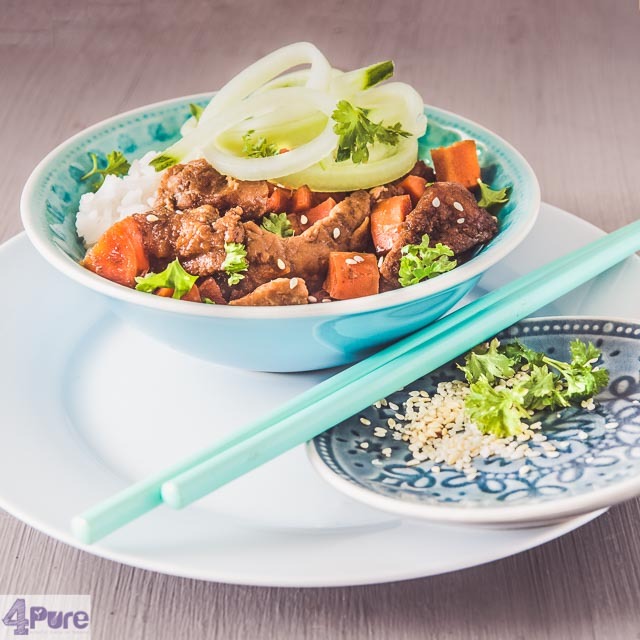 Mongolian beef, nice and tender with a sweet sauce and vegetables. A popular recipe in the takeaway Chinese in America. In Slow Cooker version! 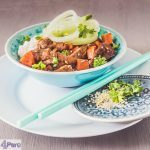 The slow cooker is a great solution when short in time in the evening. In the morning, you put your ingredients in the cooker, and when you come home at night your food is ready. And super tender, really so tender you can only get it when slow cooking it. And if you don’t have time in the morning , then you just put all the ingredients in the cooking pot the night before and put that in your fridge. Then you only have to take it out in the morning, put the bowl in the slow cooker and turn on the device. Maybe when reading the title of this recipe you might have thought: Mongolian beef (especially when you’re not living in America I guess)? Indeed it was my first thought. Mongolian beef is a specialty of the Chinese in America. As with our Babi Pangang and Foe Young Haito which is served in any Chinese in the Netherlands. Seemed like a good idea to prepare it. By cooking it in the slow cooker you get very tender meat, a tasty sweet sauce (not spicy) combined with vegetables (and I opted for carrots). Serve with some rice and cucumber strips and you have a delicious meal. Cut the beef steak into thin strips. Put the meat in a bag and scoop the flour in and close the bag. Shake well so that the meat is covered with flour. Put the meat in a slow cooker. Add the remaining ingredients and mix everything. Set the slow cooker to low and cook for 6 hours. 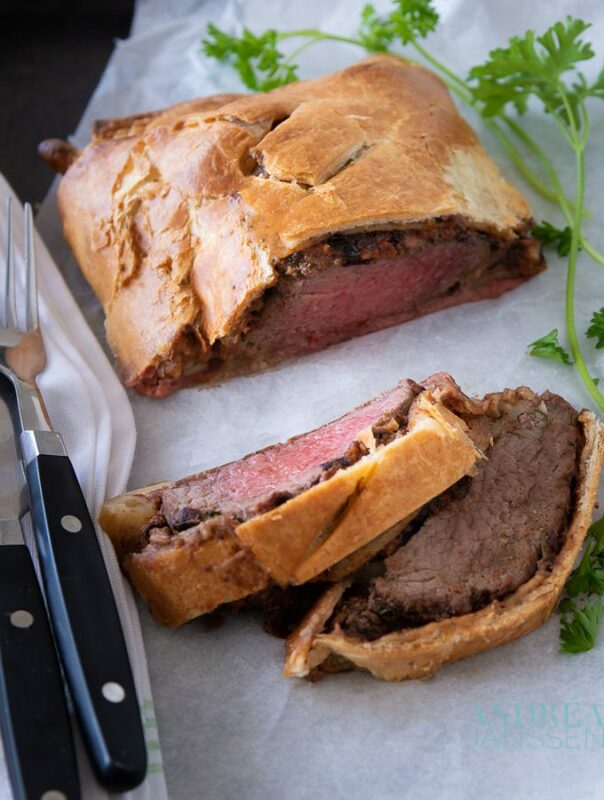 If you are very late and you have less time, use the high setting and cook the meat in 3 hours. Serve with rice and cucumber strips for example. Today is national pancake day in Holland! Did you know that? Never mind, I didn’t hear of it until this week. Or honestly read it this week on a blog. And that gave inspiration for a pancake recipe. 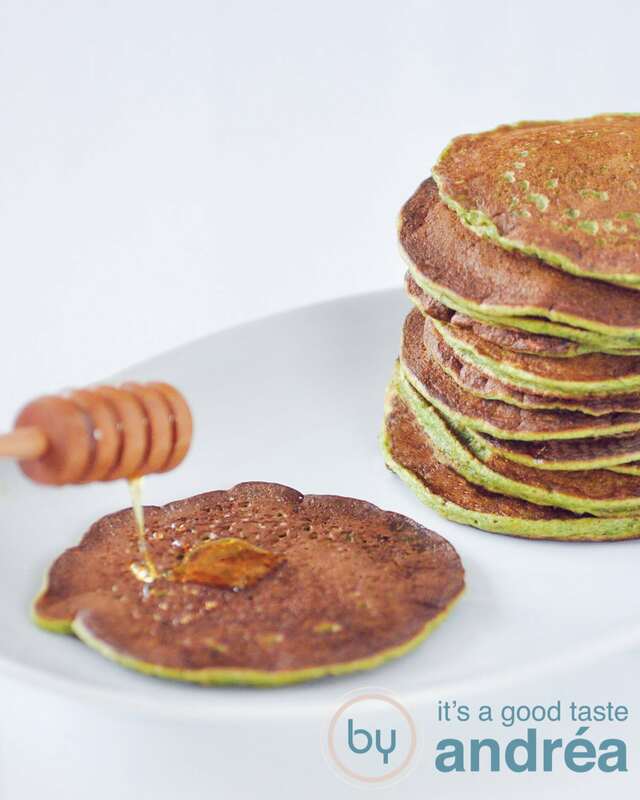 I’ve then been thinking about it, but given the recent results from the national nutrition survey (Dutch) , where it appeared that only a very small percentage of the population eats enough fruits and vegetables every day, I’ve made this pancakes and added spinach. And to be honest. You don’t taste it.